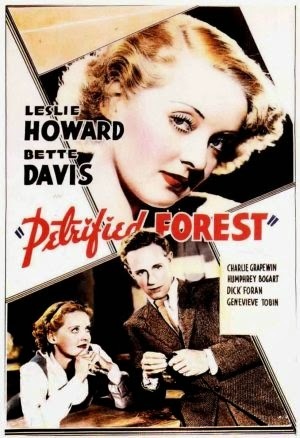 If I dare say this film begins as a rather dull budding love story between a philosophical drifting author (Leslie Howard) and a inquisitive young server (Bette Davis) at a roadside gas station in Arizona. It looks like it’s not to be as he is intent on moving on but then comes murderer Duke Mantee (Humphrey Bogart) with his thugs and things heat up a little bit. His arrival brings up some interesting points of contention and Leslie gains some new found conviction. But that’s not the half of it. This film comes from the stage with Bogart reprising his star making role as a gangster. It is often talky and sometimes stagnant but the supporting characters and Bogart have enough personality to at least make it passable and a tad interesting. I was never a great fan of Davis, but I have to admit at least she does not look scary in this one. She’s still young and on the rise when this film came out. Leslie Howard is enjoyable with his pleasant delivery but Bogart really lights it up. His glowering face and growling voice are hard to clear from your mind. That’s for sure. The film also has immense commentary on the survival of the fittest, women, the mythical Old West and fascist ideology that are a sign of the times. This entry was posted in 1930s, Drama and tagged Bette Davis, Humphrey Bogart, Leslie Howard, Stage by 4StarFilmFan. Bookmark the permalink.